Lunch was followed by a cake for Charlie’s birthday (He has one of the links from our page). When the twin otter came in, Jason and Imet Keri and the crew at the supply stash/parking area for the Ken Borek flights. 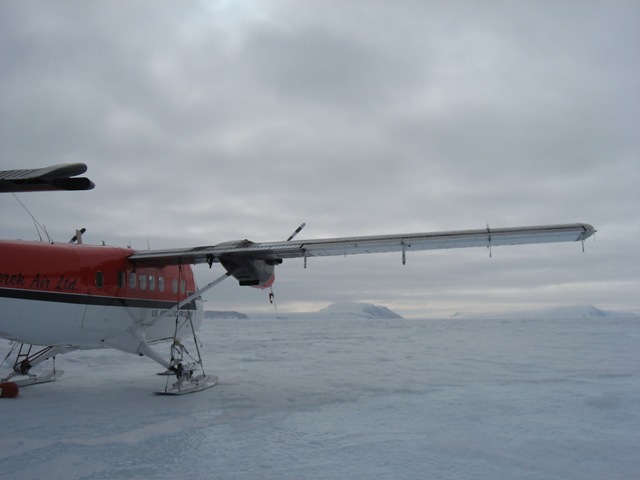 Ken Borek Air is based out of Canada and generally runs tourism missions around the ice. They are often contracted by the NSF to support various research, as well. Jason snapped a photo of the plane with a sun dog overhead. Once they were parked and ready, we started helping with the loading process. 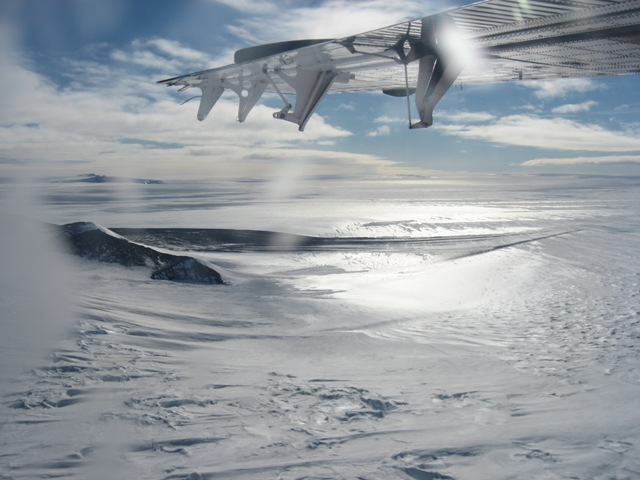 They needed some colored garbage bags to establish a runway on the glacier. While I was on radio trying to help the process, they began prepping a ski-doo (snowmobile to ride on the plane. Essentially, Jason and Eric (a cargoperson who had gone on the first support mission of the day) were to gaurd the plane on either side of a ramp while the pilot drove the ski-doo up a ramp. It was one of the craziest things I have seen. That was followed with loading of various coolers with food, stoves, alchohol (we think), and fuel for stoves, etc. Then we rolled 2, 55-gallon drums full of fuel up the ramp and they were uprighted and strapped into place. With that, we were ready to get fuel and be off. Unfortunately, one of the C-130’s from Mactown was approaching final and we were delayed fuel/progress for 45 minutes (approximately). We agreed to meet back at the flight deck when it was time. Within minutes of the departure of the C-130, our twin otter was fueling. Jason said he would take photos from the flight deck of me and asked me to do the same. Keri and I loaded the plane and received our briefing. Our seats were in the back of the plane (between the 55 gallon drum of fuel and the cubbyhole with propane tanks and coleman fuel for stoves. 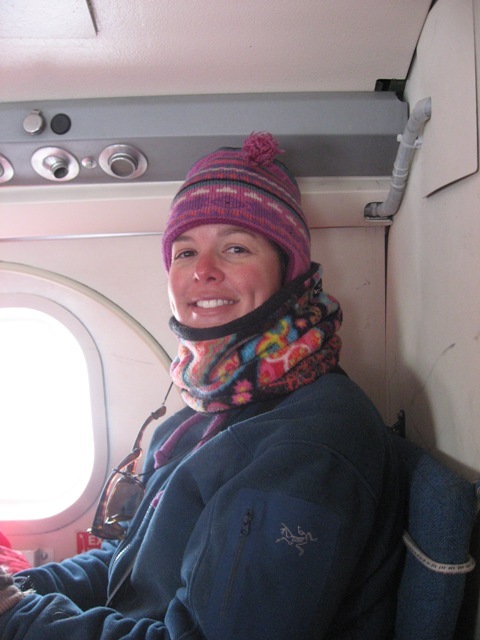 Keri’s knees were almost up against a 55-gallon drum of fuel and I had a bit more leg room. The co-pilot shut the door and we buckled in for take-off. Unfortunately, we took off in the opposite direction that the C-130’s usually depart. I never saw Jason after we boarded the plane. 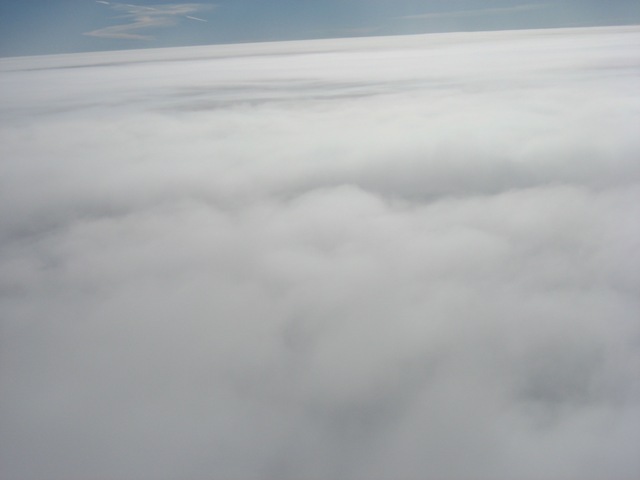 Initially, after taking off, as far as we could see there were low clouds. We were beginning to think it would be a somewhat boring flight of clouds, but it quickly opened up. Keri and I chatted and stared out the window at the flat terrain and the few sastrugies that you could see. 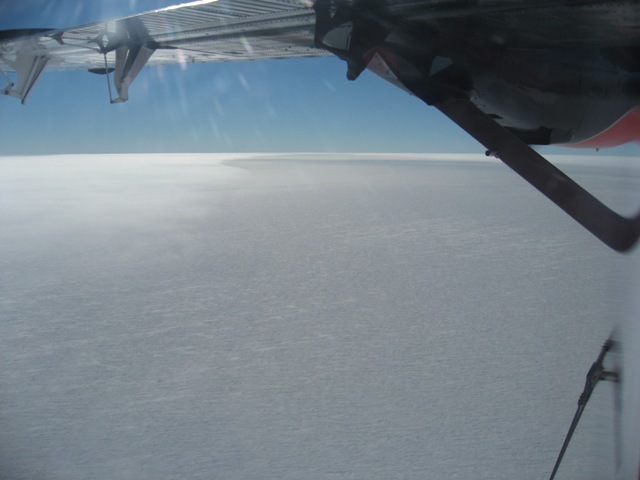 At some point I looked out on the horizon, shortly after take-off, and could see a plane heading into McMurdo along the coast — you could really only see the contrails, but it was cool to think about how far /what you could see. After about 45 minutes, she pointed out the window and told me to look out ahead of the plane. 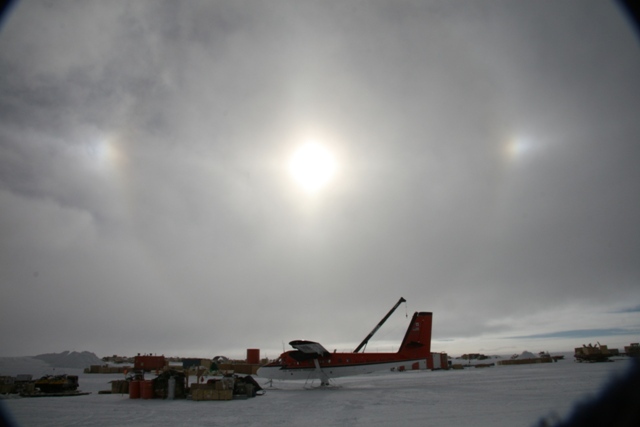 It was our first gelogic feature since the flight to Pole. It wasn’t much, but it was beautiful. As we got closer, formations grew in size and number. Somewhere in the last 15 minutes before landing on the glacier, I took a picture that I absolutely love (and I sometimes check it out now to enjoy). 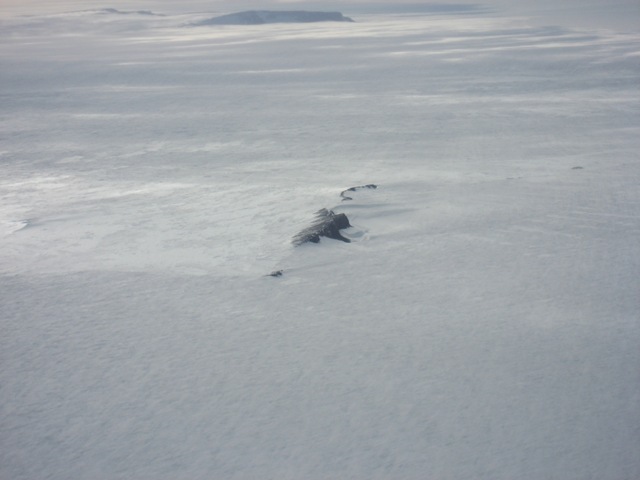 There was a small frozen water surface between some mountainous outcrops near a crevasse. As we came in for a landing, I decided to try to shoot a video. Just so you know before you watch it, we didn’t crash. As we soon learned, the surface was a bit rough to say the least. Keri and I jumped off the plane and backed away as they put a ramp to the door and rolled the 55-gallong drums out the doorway. 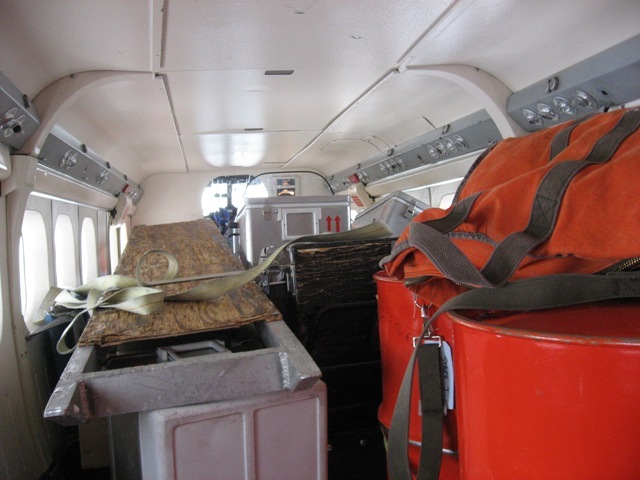 After that, one co-pilot worked on filling some small orange duffle bags with snow (the bags they use to give us our ECWs) ahile the other hopped in the plane and moved boxes to the door. Keri and I unloaded all the equipment. Then, it was time to get the snow machine out. The 2nd pilot hopped intot he plane and they wiggled it to the door (rear first). Keri and I grabbed a side and turned it to line it up with the door and guide it to the ground. Our job was to guide it to the ground and let it drop at the end. Then we pulled the rear back and let the front drop down. We were successful! The pilots then took the orange bags and began using them to lay out a runway for future flights. 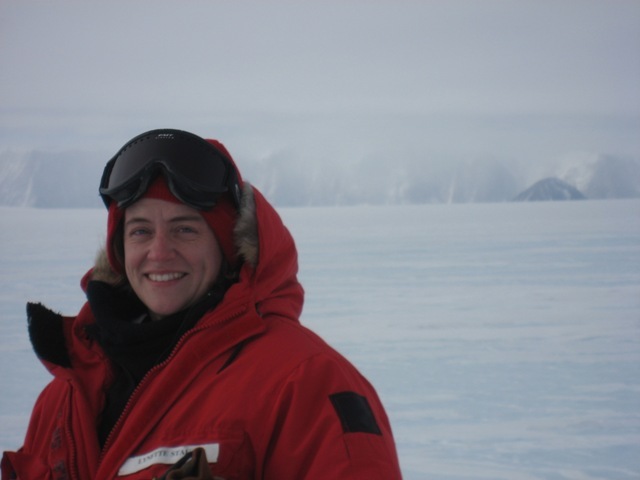 That gave us time to explore our surroundings a tiny bit - I had Keri take some pics of me on the glacier. 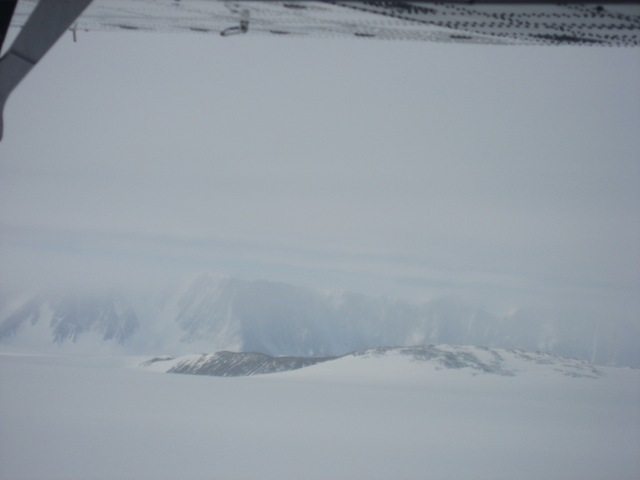 There were 2 different textures that we noticed about the surface of the glacier. 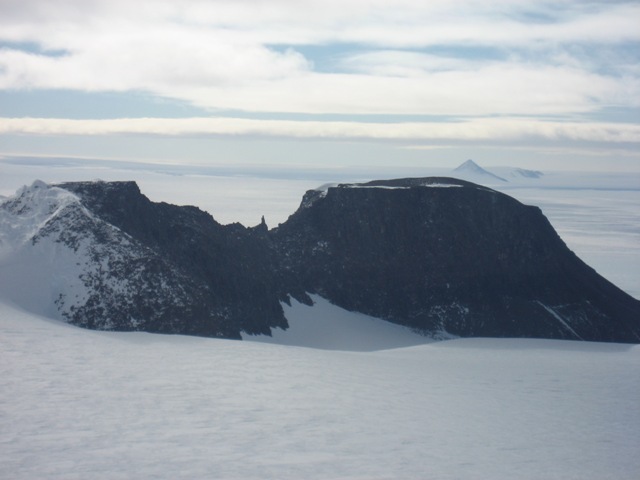 In some areas, it was fairly flat with tiny little “seams” that were filled in with ice/snow. It looked almost like caulking bathroom tiles. 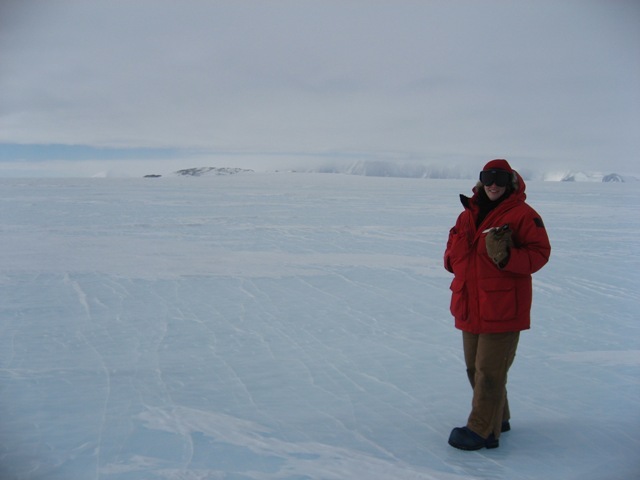 In other areas, the surface was frozen bumpy like tiny little waves. It was almost more like dimples in the surface that didn’t necessarily go in any one direction. We quickly came to a stop and pulled up near some supplies they had previously dropped off. It was freaking cold. The wind blew much greater here on the glacier and our hands would get really cold really fast. Additionally, neither of our cameras appreciated the temperatures. When the pilots were ready to go, I asked which side of the plane would have the best views. I had the better seat on the way in and wanted Keri to see the sights. He told me the left side. With that, he put both left seats down and told us he would fly a 360 around the area so that we could soak it in before returning. It was awesome. Unfortunately, both our cameras weren’t cooperating. My battery was dead and Keri’s had gotten cold. We enjoyed it, though. With that, we began the flight back. I fought to stay awake, but loved every bit, even the “flat snow” near pole has some interesting textures that are cool to see from height. We got back in plenty of time to join the gang for dinner and enjoy a tequila shot toast in honor of our friend Charlie’s birthday.